Bake the popcorn chicken according to package directions. Set aside. Place rack in the center of your oven and preheat oven to 400°F. 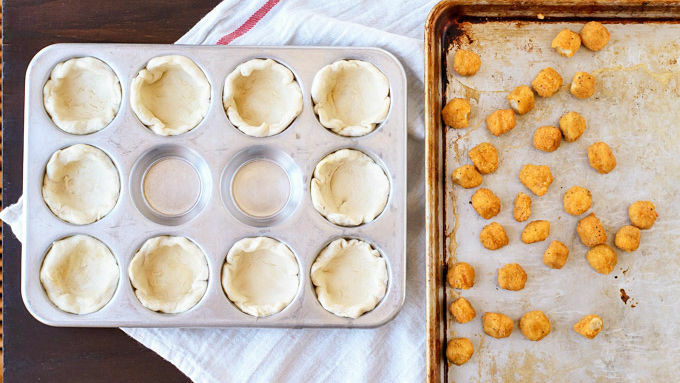 Lightly grease a 12-cup standard muffin tin with cooking spray. Lightly flatten each biscuit, then press in the bottom and up the sides of the prepared muffin cups. Use the wells at the edges of the pan, as the cupcakes at the edges will rise more when baked. In a large mixing bowl, stir together the sour cream and Buffalo sauce. Add the cooked popcorn chicken and celery. Toss gently to coat. Spoon the mixture evenly into the 10 biscuits. Sprinkle tops with cheddar cheese, then bake for 12-15 minutes, until puffed and golden. Remove from oven and let rest 3 minutes. Garnish with feta and cilantro, then serve. These creamy, cheesy, spicy cupcakes are an easy app to make for parties or game day gatherings. Buffalo chicken is the ultimate party icebreaker. 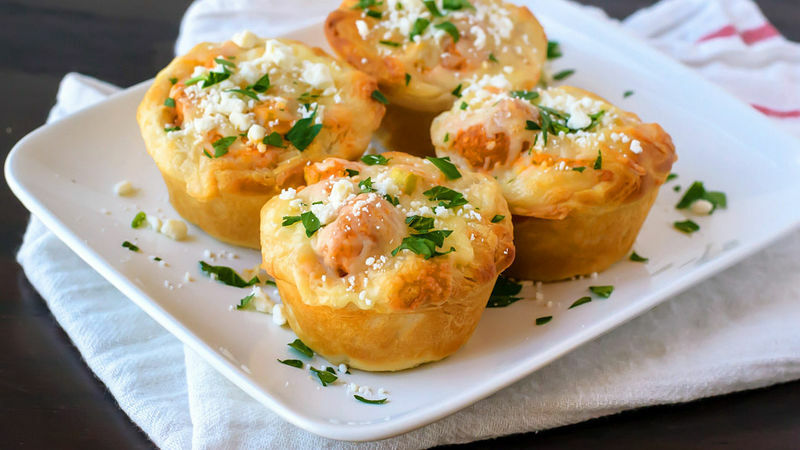 Whether you're hosting a black tie affair or just watching a game, guests unite over this mysteriously addictive, lightly spicy flavor phenomenon, especially when it’s served cordon bleu cupcake-style. Fluffy Pillsbury™ biscuits wrapped around popcorn chicken that’s bathed in a creamy Buffalo sour cream sauce, these are destined to be devoured. Easy, cheesy, and loaded with Buffalo flavor, they're a great pick for any gathering! Store-bought ingredients make this recipe simple to pull together. Grab Pillsbury Grands Jr. Buttermilk Biscuits for the crust, frozen popcorn chicken for the meat, and sour cream + Buffalo sauce for the rich filling. Cheddar and feta add extra cheesy goodness, and diced celery provides freshness and is a classic pairing with Buffalo sauce. 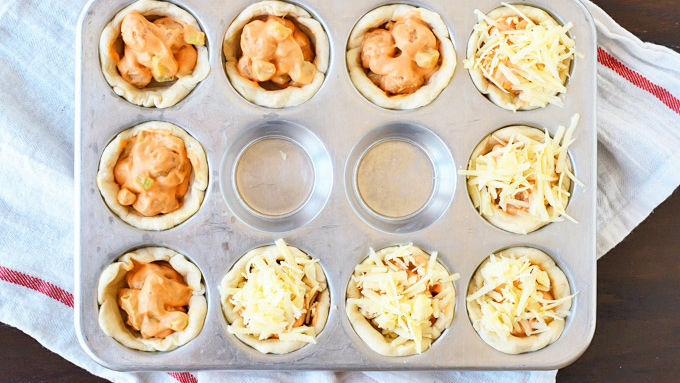 It’s almost like having 10 mini Buffalo chicken pot pies to share. Or, you know, not to share!